Nova Scotia, the Canadian Province has recently announced to reopen the Nova Scotia Demand program under the Express Entry stream as a part of the Nova Scotia Nominee Program (NSNP). 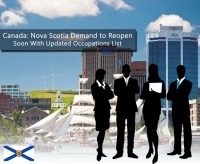 The province released a modified list of the employment opportunities in demand. The revised list consists of 16 profiles out of which 8 are a new addition whereas remaining 8 occupations have been there on the previous list as well. 16 jobs enlisted in the occupation list are: Financial Auditors and Accountants , Other financial officers , Professional occupations in advertising, marketing and public relations, Administrative assistants, Accounting and related clerks, Civil engineers, Information systems analysts and consultants, Computer programmers and interactive media development, Computer network technicians, User support technicians, Registered nurses and registered psychiatric nurses, Licensed practical nurses, College and other vocational instructors, Paralegal and related occupations, Social and community service workers and Financial sales representatives. According to an official statement by the province, in the coming months – up to 250 applications will be accepted under the B-Category of the stream. In order to be eligible to apply under this stream, the applicant needs to have a minimum of one year of experience. The Nova Scotia Nominee Program has not opened since 2015 and it gives invitations on the basis of first come first served. The candidates who are willing to apply for the PNP under the Category B of Nova Scotia Demand should have a valid profile in the Express Entry with 67 points. Should have cleared English Language test with a Canadian Benchmark level of 7 and have at least one year of full-time or equivalent part-time (continuous) skilled work experience in the last 10 years and must possess experience in above mentioned 16 jobs.